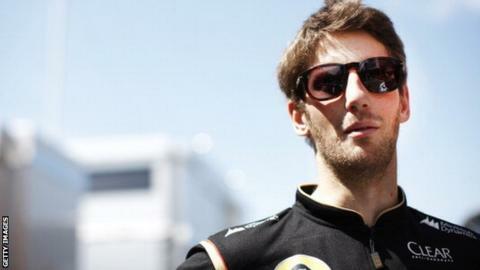 Lotus have confirmed that Romain Grosjean will remain as a driver for the Formula 1 team in 2015. The Frenchman, 28, has driven for Lotus since the start of the 2012 season. He has had a difficult time this year, finishing in the points at only two races, in Spain and Monaco. "It's no secret that we've had a really tough season this year, but the team has remained focused and we're all determined to return to regular points-scoring in 2015," he said. Gerard Lopez, team principal at Lotus, said: "You really learn something about a driver when they have the chips against them and Romain has delivered impeccably in 2014, despite the very big challenges he has faced." Grosjean took a while to settle in F1 and had a year to forget in 2012, when he was given a one-race ban for causing a multi-car pile-up at the Belgian Grand Prix, his seventh early incident in 12 races that season. At the time, Red Bull's Mark Webber called him a "first-lap nutcase". But Grosjean quietened his critics by recording six podium finishes last season, and will continue to partner Venezuelan driver Pastor Maldonado at Lotus in 2015.